Bloco Masters continues with the creation of a Bloco Big Band. Bloco Masters is a program developed for those Bloco members who are interested in creating more opportunities for regular workshops, different kinds of gigs, musical progression, music masterclasses and the opportunity to meet more often. The great thing about Bloco Masters is that everyone will have a chance to get involved; there are different Bloco Masters projects popping up throughout the year. 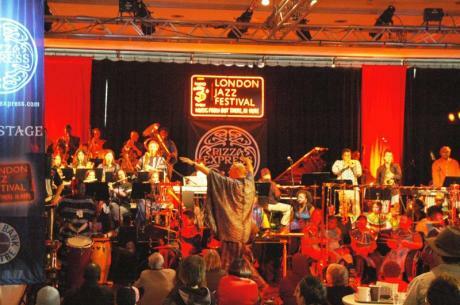 The first Bloco Masters project of 2013 has come in and for this one we have chosen some people to form a Bloco Big Band, who have a great opportunity to perform in Imagine Children’s Festival at the Southbank Centre. Dreaming and Wishing is a concert of Sun Ra and Disney classics. The band will be performing more complicated arrangements of songs we don’t usually perform as regular Bloco material, so it will be a chance to stretch our skills and to show you a side of the Bloco you probably didn’t know was there…our soft, skilled and mushy side! Why don’t you come down and support.